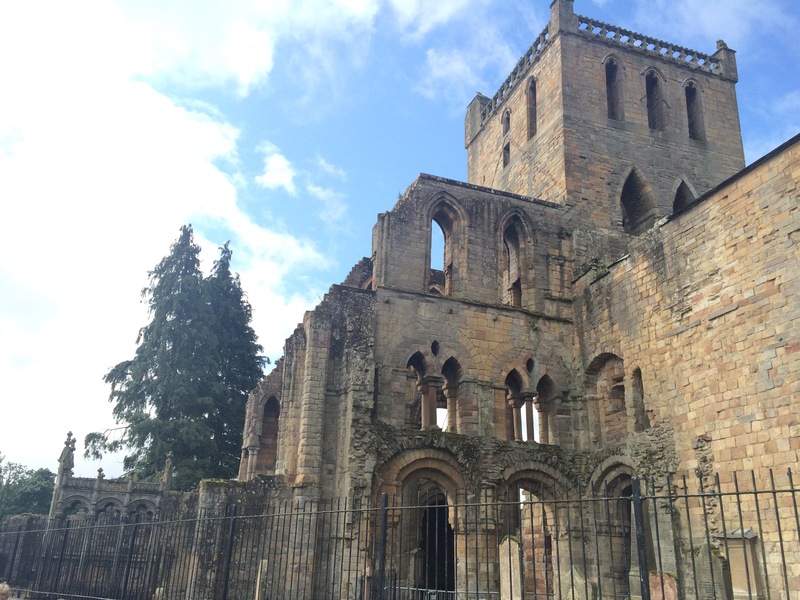 Part 3 of our trip to Scotland. 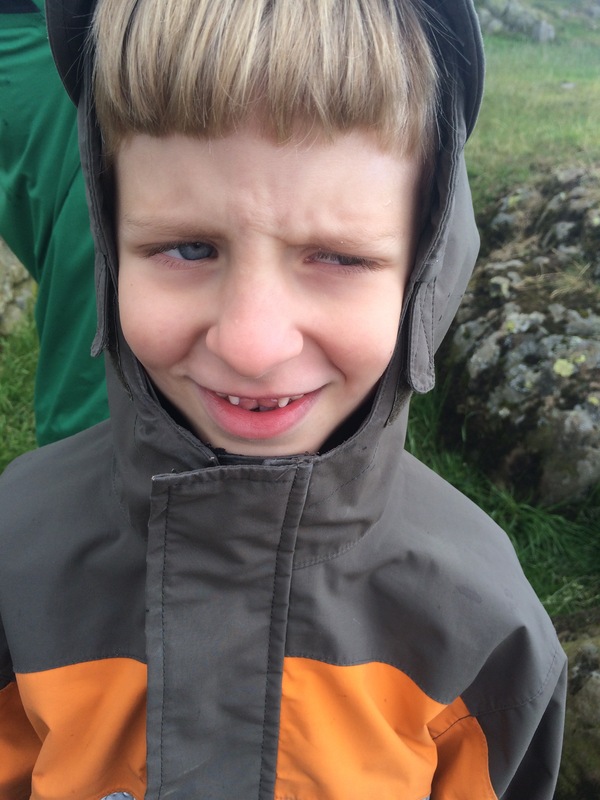 You can read Part 1 about Edinburgh Castle and Part 2 about Harry Potter here. 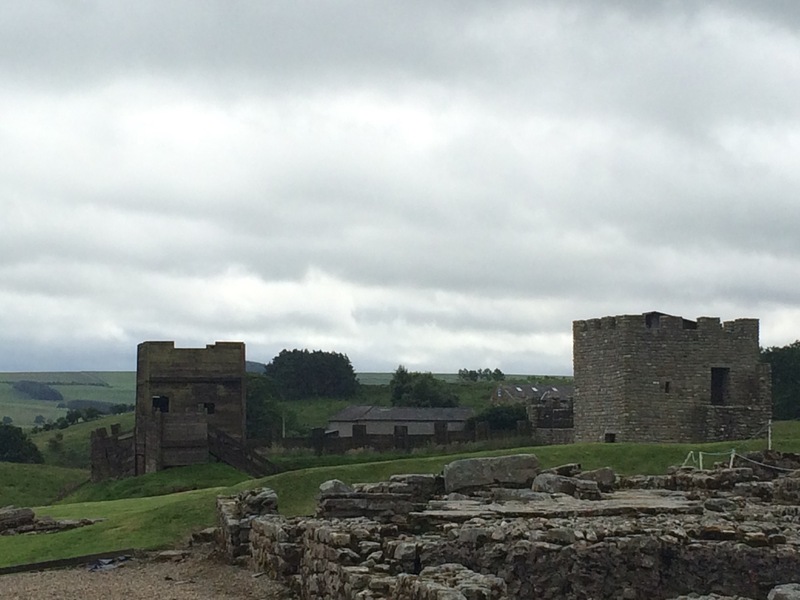 And here we reach what E considers the pinnacle of the trip to Scotland: going to Hadrian’s Wall. 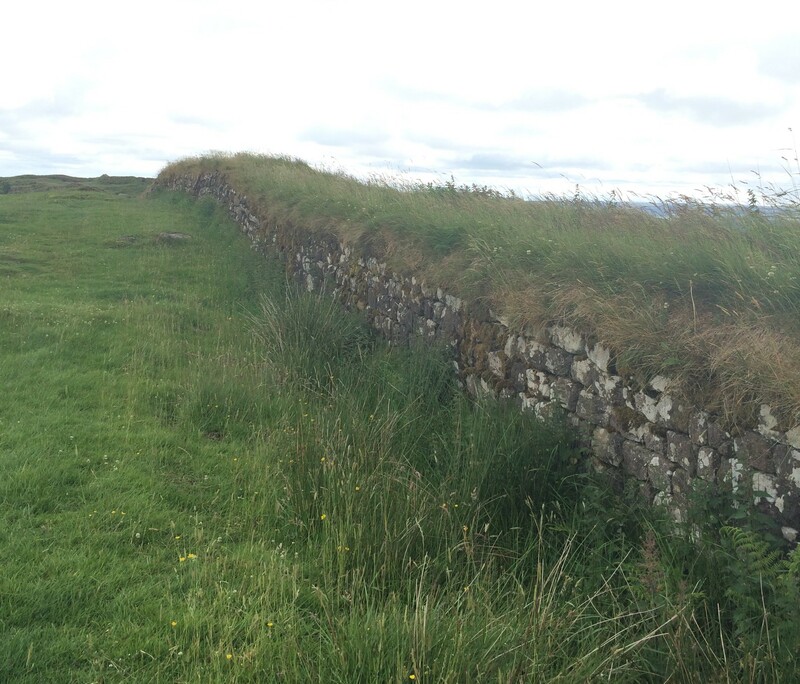 Hadrian’s Wall is a real wall. 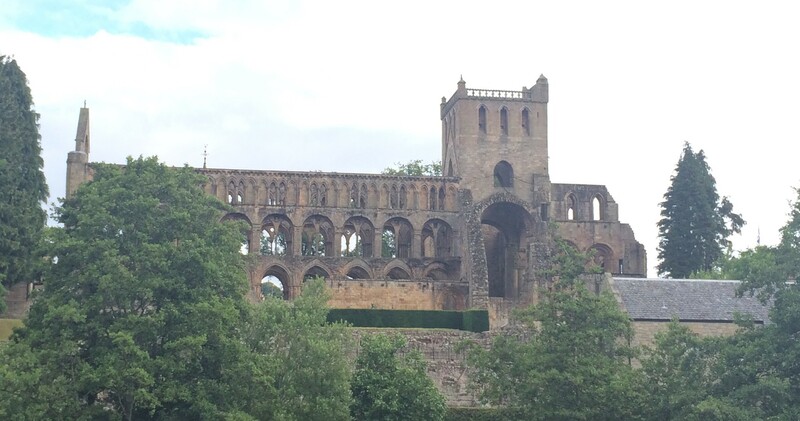 It was built in 122AD while Hadrian was Emperor of Rome to keep the Picts from attacking Roman settlements. It was also to be used as a check point where customs duties were collected, smugglers were captured, and tax moneys were spent. The Wall is a feat of engineering. It is 80 Roman miles long, which equals 73 modern miles. 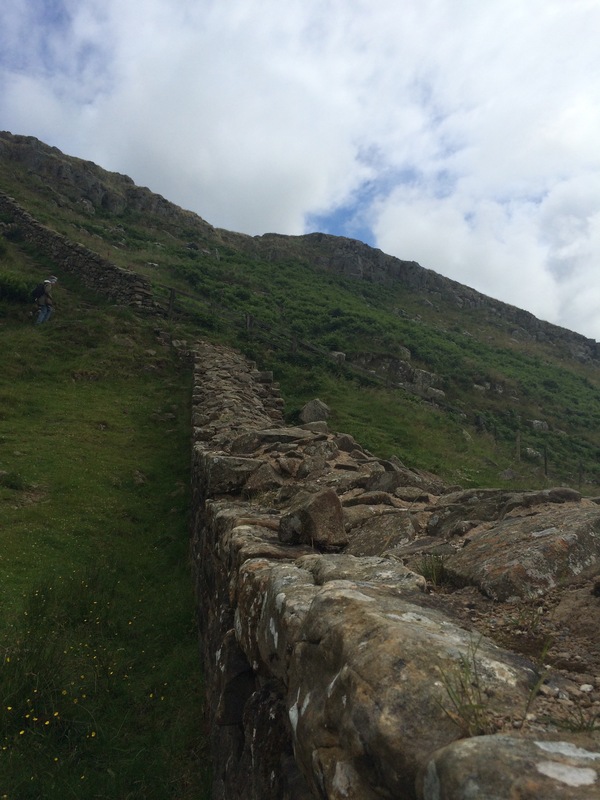 Each soldier was given a section of the wall to construct and keep up which resulted in a really quick construction time – only 6 years! 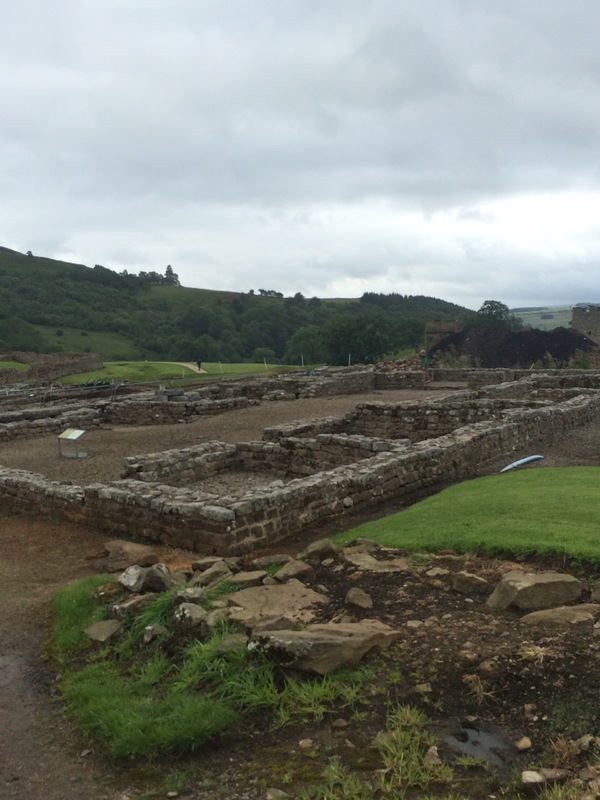 They even constructed a fort, which includes residences, markets, and barracks, every 5 Roman miles along the wall. We signed up for a tour and so we had a driver that absolutely knew what side of the road to drive on and had all the GPS directions. He was really nice and funny, gave us loads of information about the cities we passed along the journey, and pretended not to mind it when E corrected him on his Roman facts. 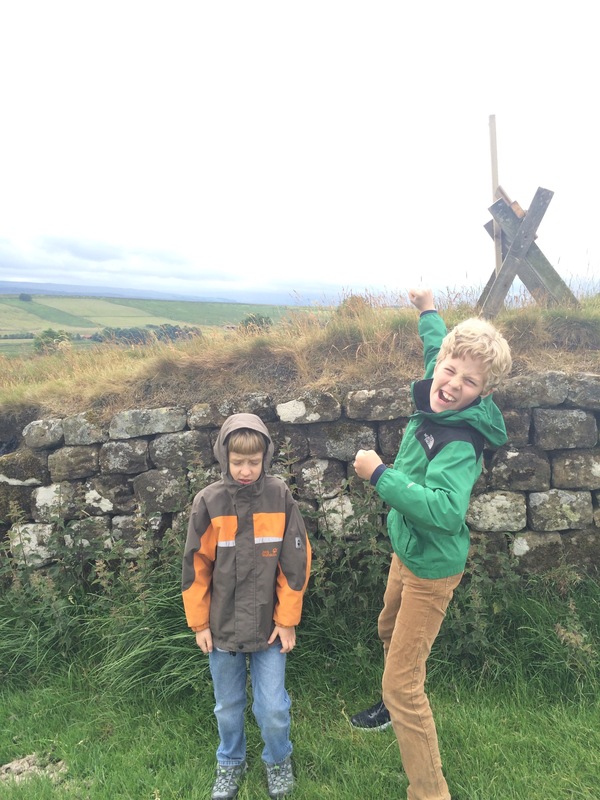 Hadrian’s Wall is actually in England. Not in Scotland. Totally different. 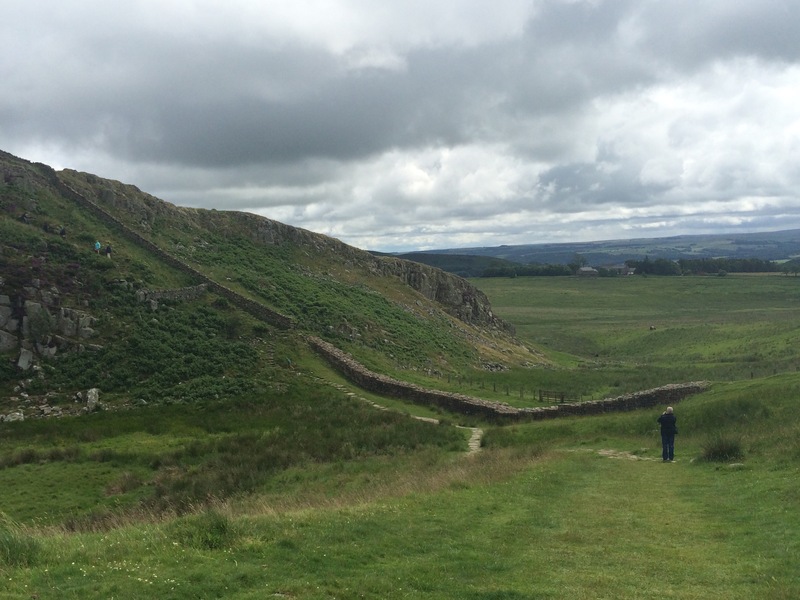 If you are thinking of a wall in Scotland you are thinking the Antonine Wall. 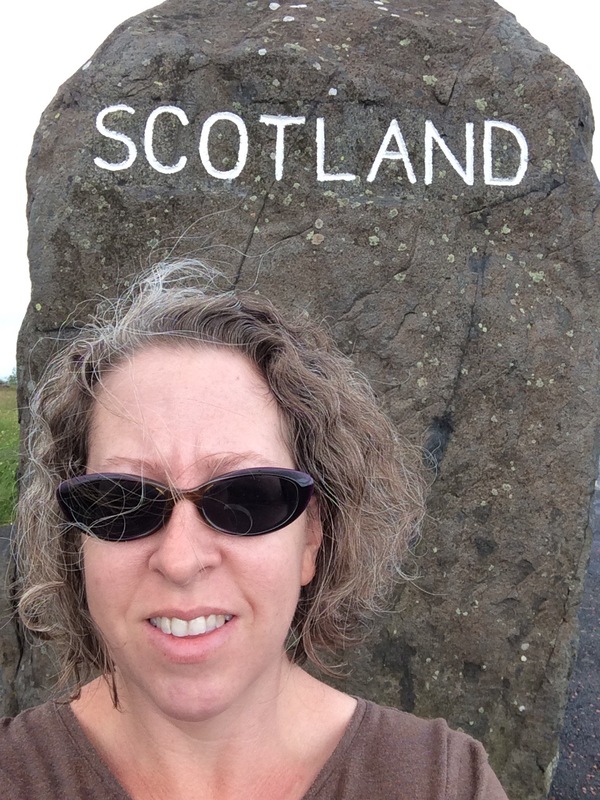 And just to prove that we are not in Scotland we stopped at the border for pictures! 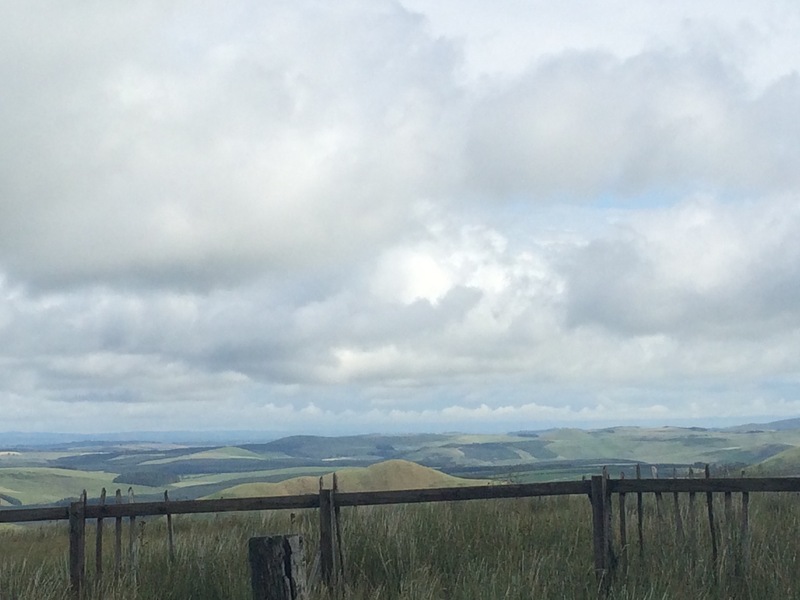 The borderlands are beautiful though. If it hadn’t started raining I could have been there for hours. 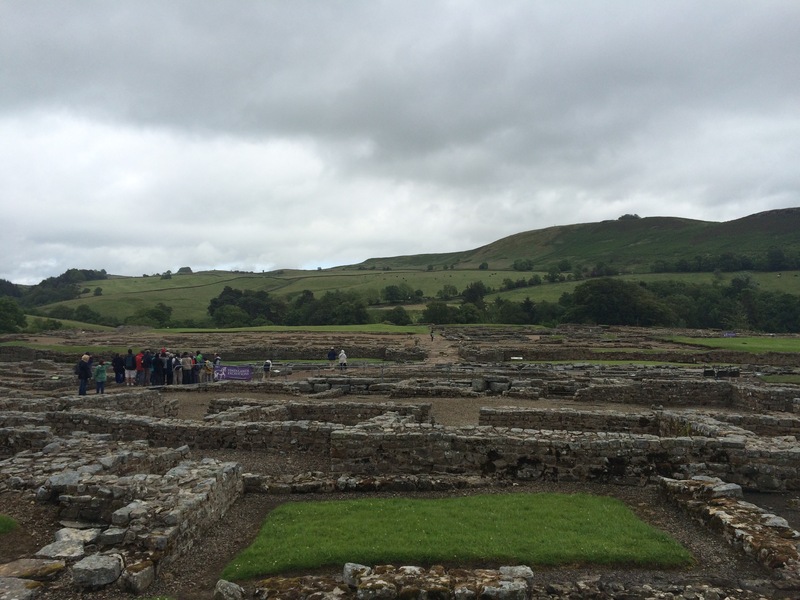 We made a couple of stops along the way towards England and Hadrian’s Wall. 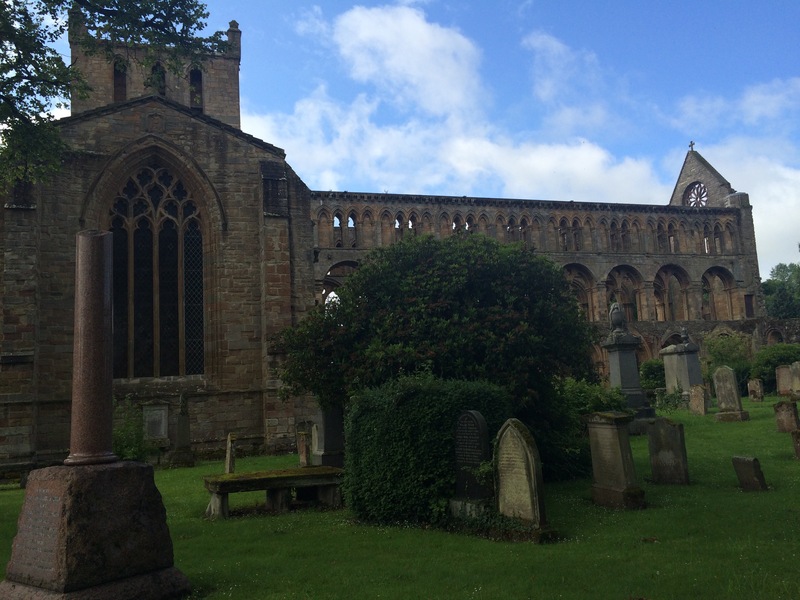 One of our stops was at Jedburgh Abbey (rhymes with Edinburgh, not Pittsburgh). 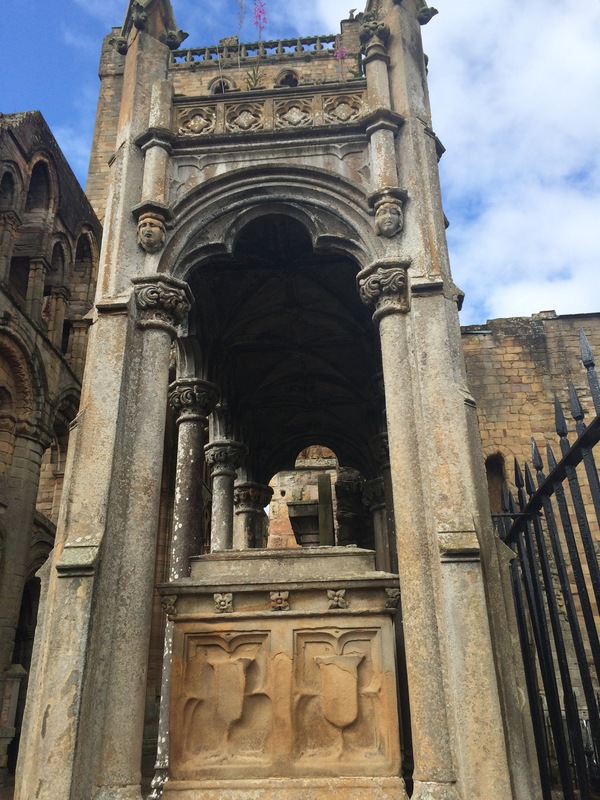 It was founded in 1118AD by David I of Scotland for the Augustine order. The monarchy continued to build onto it through the late 1300s until and the English started to take smacks at the church in the 1400s. Different English Earls plundered it and burned it like it was a sport during the 1500s and finally during The Reformation it was disbanded for good. At this point the children were begging me to put away the camera and just get back to the van. So what if we were the only ones at the car? Please, just put the camera down. 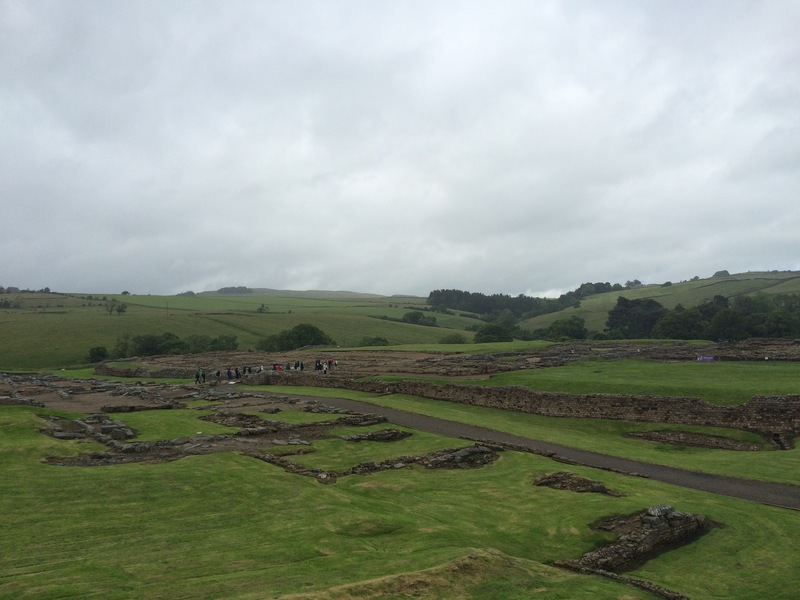 We continued on towards the border lands and learned more about ancient Scotland. Particularly the Border Reivers. Now, I am a sci-fi fan. And in particular I am a huge fan of Joss Whedon. He did this great series in 2002 called Firefly where a constant source of fear/menace was a group of crazed berserkers called Reavers, which is pronounced the same as “Reivers.” So at first when he was talking about the Reivers I was a bit puzzled. Then when he started speaking in proud and slightly wistful tones about one of the most feared forces in sci-fi universe I became extremely nervous. And it turns out Reivers and Reavers are somewhat similar. 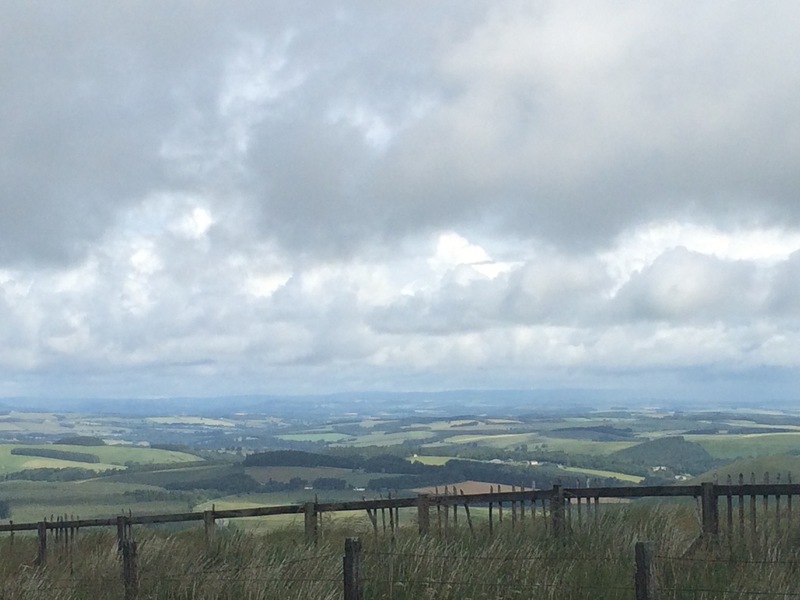 Reivers were once people encouraged to settle the border lands of England. They learned how to fight and defend themselves against the continual warring factions of the Middle Ages and then when the number of people settled there grew to be more than the land could support the people turned to raiding settlements further in and robbing travelers. They rustled livestock, stole easily carried valuable items, and held prisoners for ransom. And they weren’t just Scottish. The Border Reivers were a group of both English and Scottish people who would raid any settlement convenient to them. The Reavers (slight spoilers ahead) were also a group of people encouraged to settle on the border lands of the galaxy, however, there were turned into blood thirsty madmen through other means. 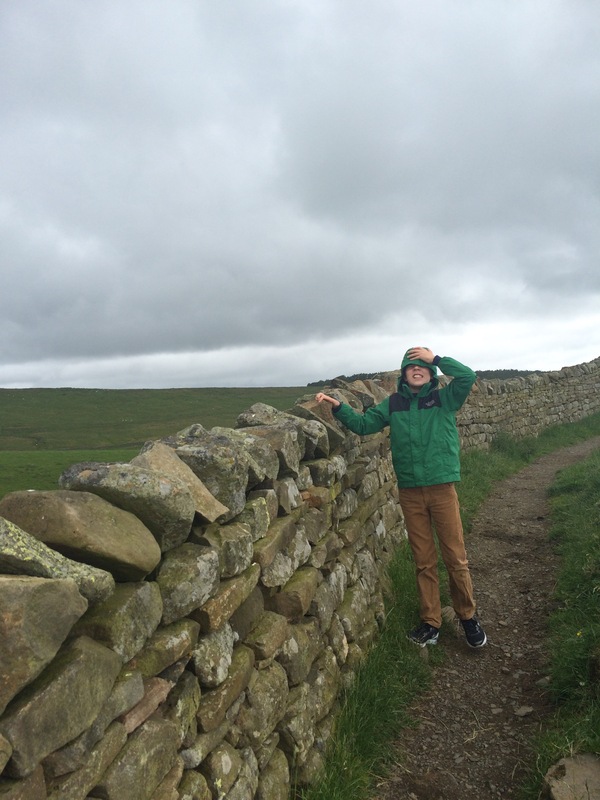 Finally we made it to Hadrian’s Wall. E was giddy with excitement. Here was an actual border of the Roman Empire. He burst out of the van and ran through a pasture to the Wall. 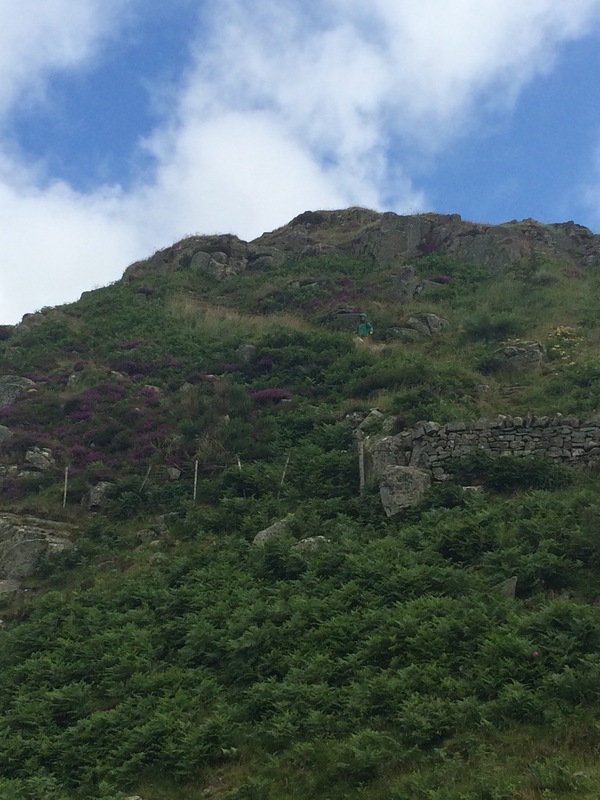 He followed it down a hill and then scaled up a huge rise so he could get a good view. H stayed walking by me and made chatty comments about the wind. It’s a little windy for H. E doesn’t even realize there might be a breeze. If you look beyond the urchins posing in front of the wall you can see the blocks of the wall. The incredibly perfectly squared-off blocks of the wall. It is meticulously done and there is no mortar or filler whatsoever. They are so perfectly done many of the locals, back in the day, couldn’t see leaving such nicely square blocks just sitting there in the middle of a cow pasture doing nothing of any value, so they took them and used them in the foundations of their houses. It’s not like they could just drive to the nearest Home Depot and order a palate of blocks, ya know. Whole sections of the wall have moved from Point A to person’s house a Point B just a couple of kilometers away. The stones are so perfectly cut. An impressive feat for a soldier in 2nd century. Why don’t the preservationists just get them back? Well, this was done so long ago that the houses themselves are now of historic value and need to be preserved as-is. There are signs everywhere, however, that tell you not to walk on the wall or take anything from the wall. And they mean it. 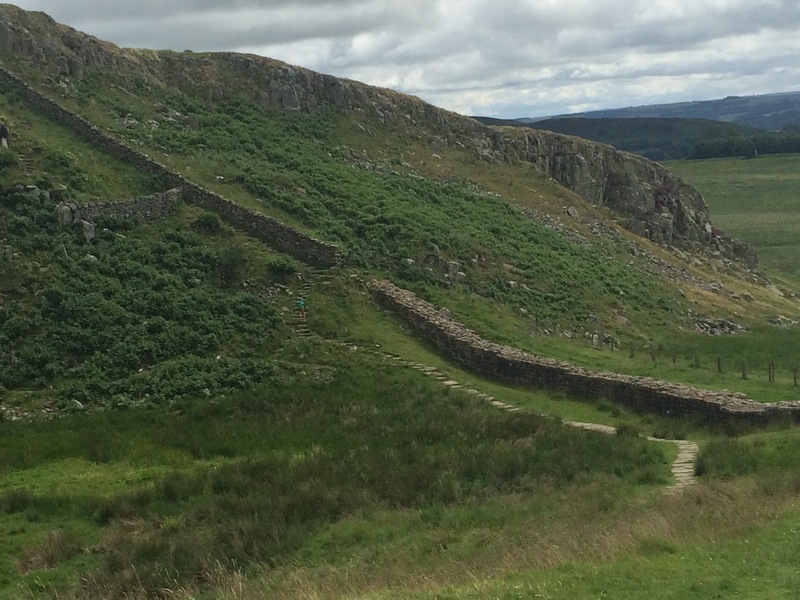 Hadrian’s Wall is more than just the stone wall. There is also a ditch in front of it that gives actually adds to the wall’s height, making it 12 feet tall. You can see the ditch really clearly here. What you can’t really see clearly anymore is that on the other side of the wall there is a raised military road, a slight mound, another ditch called the Vallum, and a slight mound on the other side. Plus this area has loads of these hills that just crop up in the middle of nowhere. 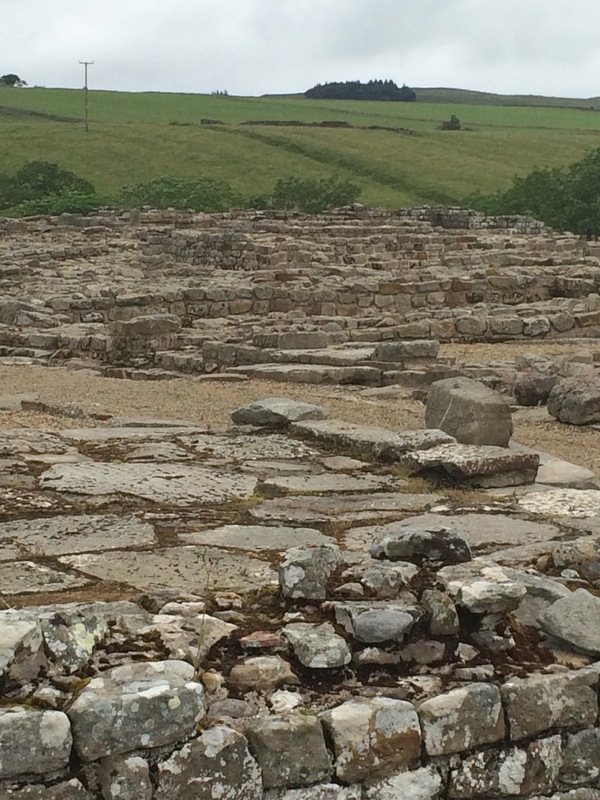 The Romans being the Romans didn’t like to go around such natural topographical features. They were told to build the wall in a straight line so, by heaven, they went in a straight line. But the kids loved it anyway! As you can probably tell from the pictures, E is just fit to burst with excitement. He literally couldn’t even put a sentence together for the entire time we were there. 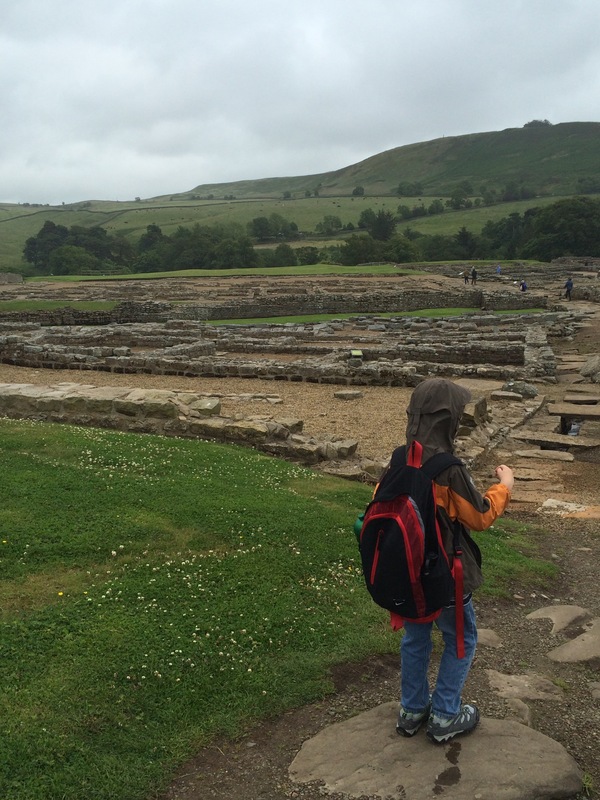 As if that weren’t enough our next stop was Vindolanda, a Roman fort just south of the wall. It is HUGE. Everything you see is the foundation of a house or shop or barracks or storage. It’s a complex and winding town and you can walk everywhere! On the rocks, in the rooms, wherever. The first fort here was wooden. They have found some signs of it, but it is way underneath the stone foundations. 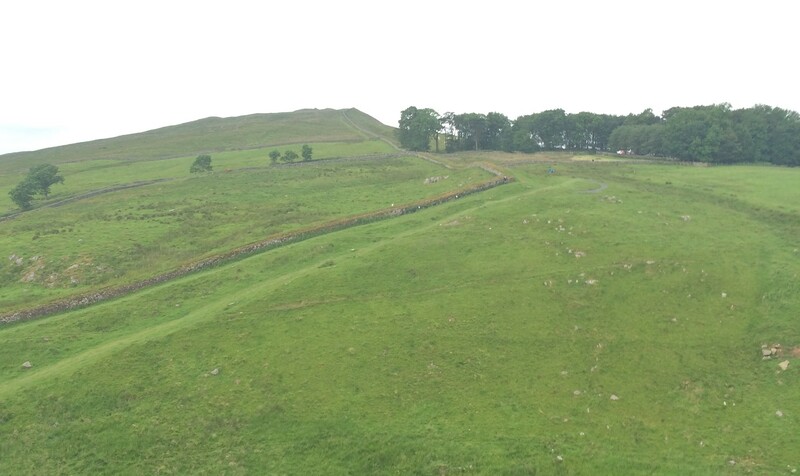 The stone fort wasn’t built until after Antonine’s Wall was built and they moved a lot of the personnel up there. 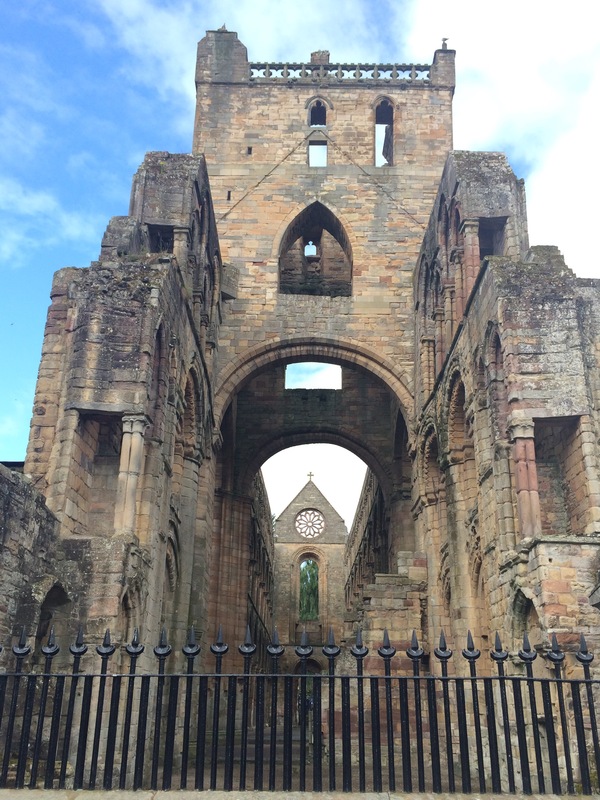 It was torn down and rebuilt at least 4 more times (that they can tell so far) before it was abandoned. 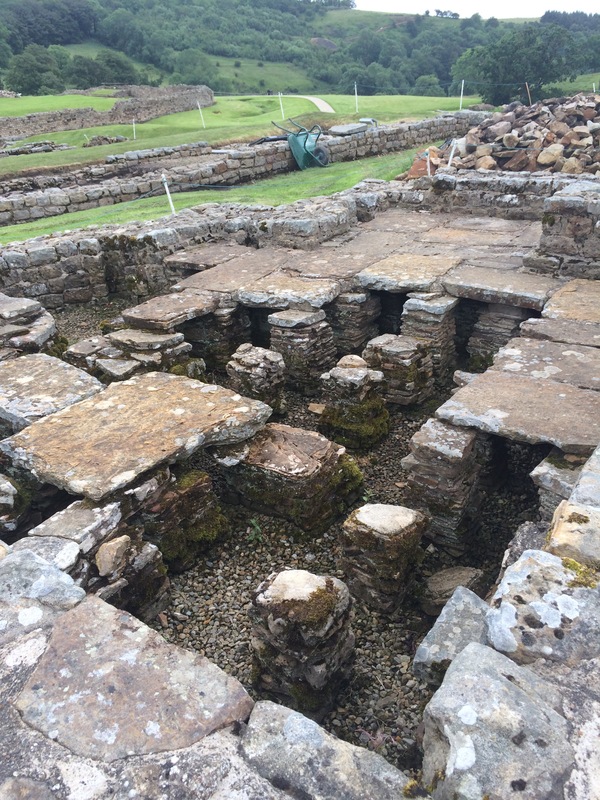 It is also a working archaeological site. It was a Sunday when we visited so everyone was off for the weekend. However, should you decide to visit during the week you can see all the archaeologists stooping down, making notes, and running dirt through sieves. They have an amazing museum/archaeologist office there where they have cases of artifacts preserved and displayed. E told me all about them. Seriously. It was like having my own personal tour guide. I barely read anything. They also have displays of artifacts undergoing preservation and study. It’s such a great view into what an archaeologist really does. I took an archaeology course as part of my anthropology minor in college and I LOVED it. I loved the digs, learning about pottery, and finding physical items that tell part of the story of a real person. I think the boys were into it, too. 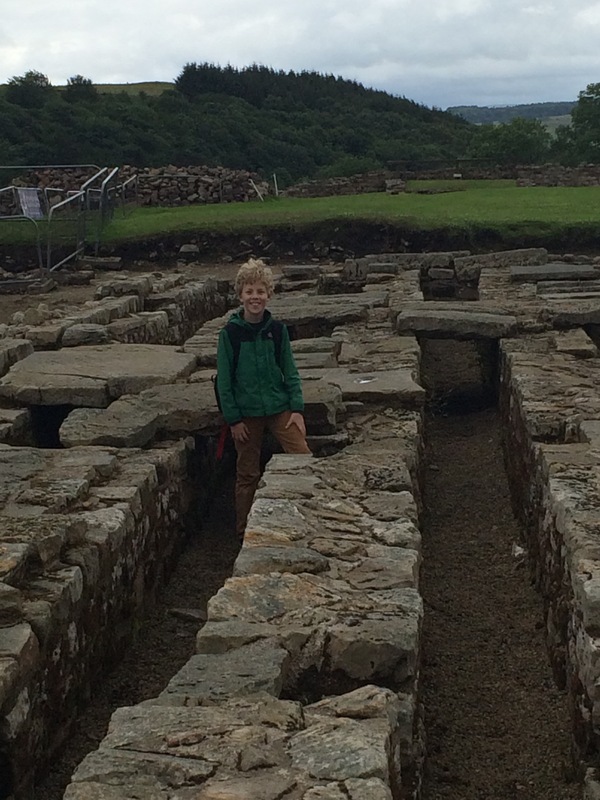 E actually listened when I started talking about how to excavate a site. I know! I was shocked, too! We were there for a few hours and then trudged back into the van to head back to Edinburgh. I didn’t even mind the time driving along. The views were beautiful and I was able to appreciate them because the boys had their noses into the books I bought them at the souvenir shop. E couldn’t wait to tell his friends and Mark all about it. And now he is in the process of begging Mark to take him back so he can show Mark everything. Stay tuned! The 4th, and final, Scotland episode will be coming in a few days.